The GPRTEM is a high resolution time-domain transient electromagnetic helicopter-borne (TDEM) system developed by Geophysics GPR International Inc. This powerful system employs a transient, also called time-domain electromagnetic transmitter that drives an alternating current through an insulated electrical coil system. GPRTEM’s receiver is installed in a towed bird that is constructed as a fiberglass casing. The system is attached to the helicopter by a weak link assembly. The system uses a 15HP generator and a large condenser to transmit alternating 4-ms half sine pulses at 30 Hz with a total dipole moment of 600,000 NIA. The GPRTEM’s system is coupled to a state-of-the-art data acquisition system to sample the transient data at 240 KHz. The current in the coil produces an electromagnetic field. The termination of the current flow is not instantaneous, but occurs over a very brief period of time (a few microseconds) known as the ramp time, during which the magnetic field is time-variant. The time-variant nature of the primary electromagnetic field creates a secondary electromagnetic field in the ground beneath the coil, in accordance with Faraday's Law. This secondary field immediately begins to decay in the process, generating additional eddy currents that propagate downward and outward into the subsurface. 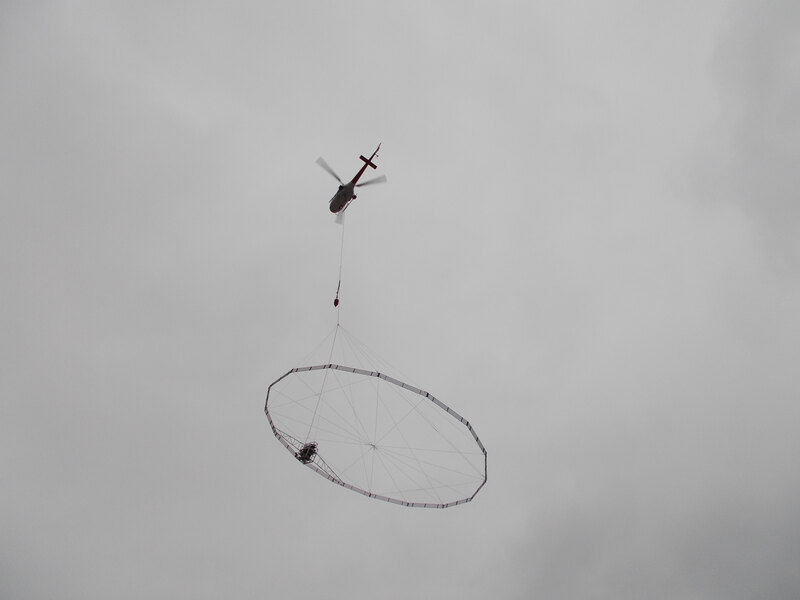 Measurements of the secondary currents are made by a vertical component receiver located almost half way between the helicopter and the transmitter loop. The boom has an elastic suspension. A proprietary suspension system protects the orthogonal coils assembly and limits the total field excursions. The tear-drop vessel acts as a vane and maintains the mast in the line of flight. Depth of investigation depends on the time interval after a shutoff of the current, since at later times the receiver is sensing eddy currents at progressively greater depths. The intensity of the eddy currents at specific times and depths is determined by the bulk conductivity of the subsurface rock units and their contained fluids. The GPRTEM system can be flown jointly with a horizontal gradient-magnetometer (or regular mag) and gamma-ray spectrometer systems. Generator on the transmitter, electrically isolated from the helicopter.